Do you ever finish a snack and feel hungry only 30 minutes later? Adding protein and fiber to your snack routine will help you stay full and energized longer. Many savory snacks, like potato chips and pretzels, lack these nutrients and they are often very high in sodium. Crispy roasted chickpeas are a delicious alternative to help you satisfy your crunchy cravings without all the salt and with much more nutrition. 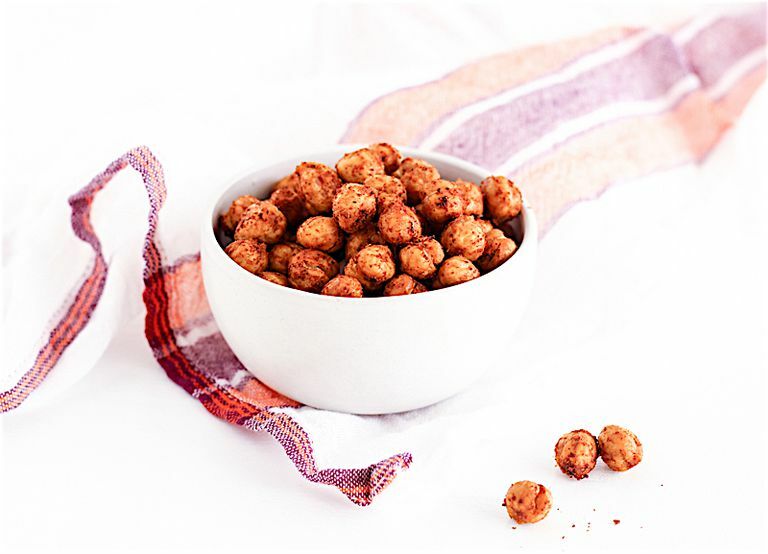 These crispy roasted chickpeas are flavored with a spicy, smoky harissa seasoning and peanut oil for lots of savory flavor. Heat oven to 400F. Line a baking sheet with parchment. Dry chickpeas with paper towels as well as you can. Add chickpeas to a bowl and toss with peanut oil. Spread evenly over the baking sheet in a single layer. Roast chickpeas for 20 to 25 minutes or until crispy. Remove from oven and place chickpeas back into a bowl. Toss with harissa seasoning until evenly coated. Spread back onto a baking sheet to cool. If you don’t have peanut oil, use olive, avocado, or canola oil. You can spice these chickpeas up with any other seasonings that you prefer, but choose spices with no added salt to keep them blood pressure friendly. Dry chickpeas as well as you can to help them get crispy. They can be made ahead of time and pre-portioned on a Sunday to provide you with a week’s worth of healthy snacks to have on hand. You can also add these chickpeas to salads and soups as a substitute for croutons.